On August 7, 2018, The Centers of Medicare and Medicaid Services (CMS) issued guidance allowing Medicare Advantage plans to implement step therapy practices for Part B drugs. The Chronic Disease Coalition joined 240 patient organizations in sending a letter to Congress urging CMS to withdraw the memo and protect patients from these harmful practices by insurance companies. Step therapy, or fail first requirements, force patients to try and “fail” on an often older and cheaper medication before they are allowed access to the treatment prescribed by their doctor. This can lead to negative outcomes for patients’ health. “A patient with rheumatoid arthritis (RA) may require a disease-modifying biologic medication to control his or her symptoms and prevent further joint damage. However, step therapy rules could force a patient to first try an older, cheaper RA medication that could lead to pain, limited mobility and long-term joint damage,” explained the letter. While the CMS guidance includes language that treatments will be “grandfathered,” it is unclear what timeline will be instituted, leaving many patients uncertain if their current treatment will be covered. 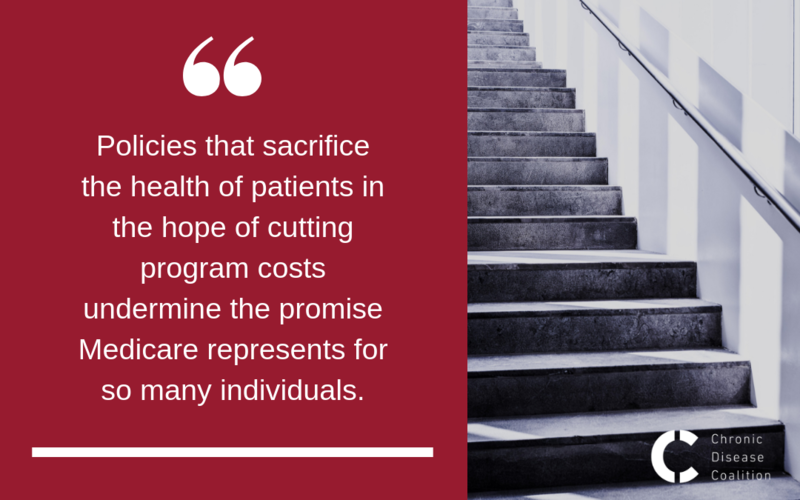 “Policies that sacrifice the health of patients in the hope of cutting program costs undermine the promise Medicare represents for so many individuals,” the letter stated. The Chronic Disease Coalition is proud to take a stand against discriminatory insurance practices. Join the fight and ensure all patients have access to timely, quality treatment.